Dream Heights is an interesting, fun new addition to the growing tower management genre of iPhone apps from Zynga. For those unfamiliar with this new tower management genre, gameplay focuses on the construction of the perfect tower. Some floors are dedicated to residential space, and the rest are used as storefronts. The people who live in your tower and pay you rent also serve as the employees for your stores. 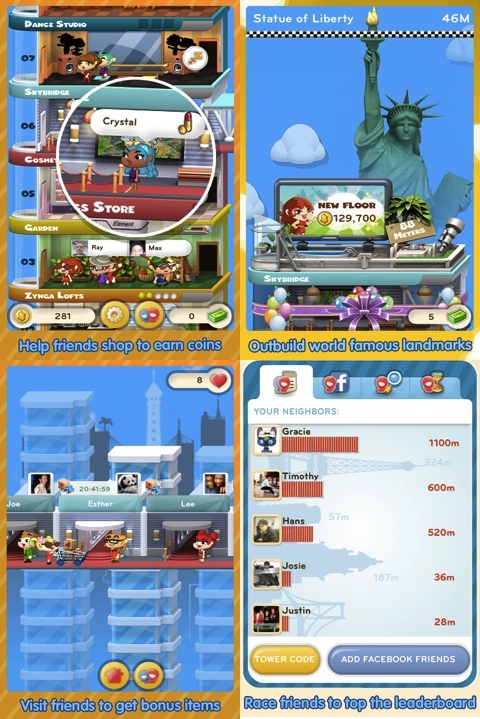 Different types of businesses require people with different types of skills in this game as in real life. It’s an entertaining task to focus on pairing the right people with the right jobs to make each floor of your tower run more smoothly. That said, there seems to be no option to evict less skilled residents, which leaves you unable to really perfect your tower. Moving in new people is a bit of a gamble if one of them can essentially end up as a useless addition to your thriving community. Dream Heights includes some social networking optimizations that allow you to make the most of your tower and interact with your Facebook friends at the same time. A skybridge allows you to make visits to neighboring towers, where you’ll be able to shop for unique collectables and for items that enable unlocks in the stores back in your own tower. Zynga has done a great job creating a quirky and fun atmosphere for this game. Even the push notifications that remind you that your stores need to be restocked are full of humor. The time constraints of restocking stores can be frustrating at times, but should be familiar to players of this genre and can be avoided through the use of in-game currency. Those looking to accrue more coins while they review the progress of their tower can control the elevator to deliver visitors to the tower to their intended destinations. Your efforts will be rewarded with a few coins, but in my experience it was rarely worth it, simply because the elevator is uncomfortably slow, even after upgrading it. The soundtrack in the background of this iPhone app isn’t bad, but at the same time it isn’t catchy or unique enough to really add anything significant to the experience. Overall, Dream Heights is a solid entry in the App Store that offers some fun gameplay. It isn’t an entirely new or groundbreaking gameplay concept (see previously released Tiny Tower from NimbleBit ), but a few nice touches make this one worth your while. The progress of your tower is matched up against famous landmarks, so you always have a goal to work towards. You’ll want to keep working to build your tower taller and taller. Dream Heights works on both the iPod touch as well the iPhone. This review was written using an iPhone 4. AppSafari review of Dream Heights was written by Darius Reimm on February 27th, 2012 and categorized under App Store, Games, Resource Management, Strategy. Page viewed 6682 times, 1 so far today. Need help on using these apps? Please read the Help Page. BDCCSSA its my code, agregadme! !